located from Canby, MN, 4 ½ miles north on Hwy. 75 and 4 miles east on 250th Avenue. FRIDAY, NOVEMBER 9, 2018 SALE TIME: 10:00 A.M.
Tract I – 160 +/- Acres: According to FSA information, this tract has approximately 150.51 acres tillable. This tract has the following bases and yields: Corn 68.7 acres w/PLC yield of 141; soybeans 68.71 acres w/PLC yield of 38. This tract also has approx. 10.4 acres in CRP w/an annual payment of $1,367.71. These CRP contracts expire in 2022. Legal Description: NE ¼ of Section 24, T-115-N, R-44-W, Oshkosh Twp., Yellow Medicine Co., MN. 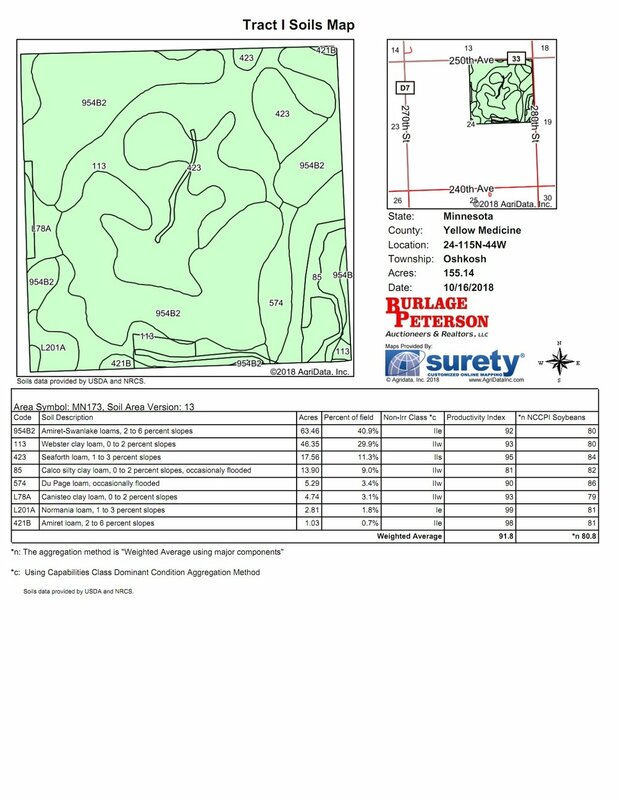 Tract II – 149.5 +/- Acres: According to FSA information, this tract has approximately 143.35 acres tillable. This tract has the following bases and yields: Corn 55.43 acres w/PLC yield of 141; soybeans 33.7 acres w/PLC yield of 38 and sunflowers 21.68 w/PLC yield of 2,115. This tract also includes approx. 31.36 acres enrolled in CRP w/an annual payment of $4,297.04. Two of these CRP contracts expire in 2019, and the rest in 2022. Legal Description: NW ¼ Less S 667’ of N 1693’ of W 654’ of Section 24, T-115-N, R-44-W, Oshkosh Twp., Yellow Medicine Co., MN. 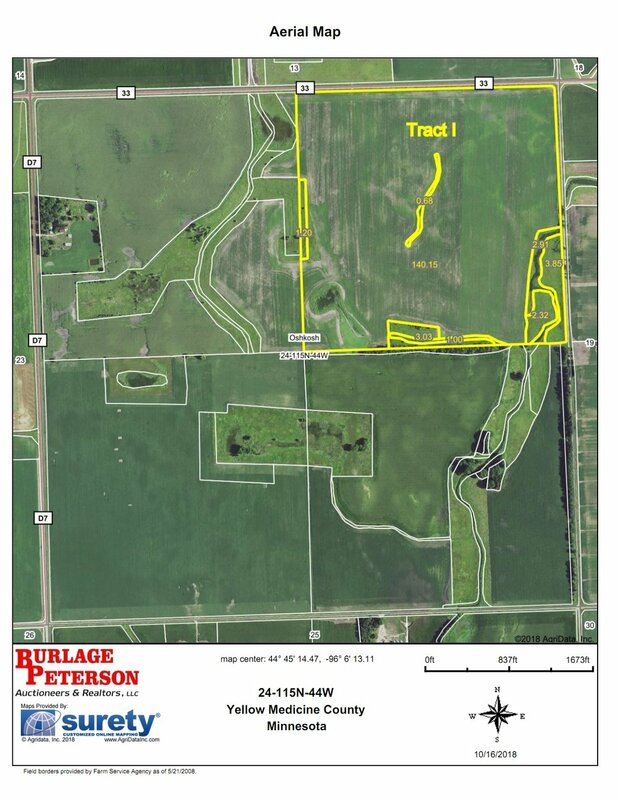 TRACTS I & II WILL BE OFFERED INDIVIDUALLY OR AS A 309.5 +/- ACRE UNIT: If Tracts I & II are sold individually, CRP acres and payments and bases and yields will be split as per the FSA Office in Yellow Medicine Co., Clarkfield, MN. We invite you to inspect this real estate at anytime. For additional information, go to our website www.burlagepeterson.com or contact Auctioneers. TERMS: 10% non-refundable earnest money deposit due the day of sale on each tract with balance due on or before December 14, 2018. The 2019 and all future CRP payments will go to the buyer. Marketable Title will be conveyed and an Abstract of Title continued to date will be provided to the buyer for examination prior to closing. 2018 real estate taxes to be paid by sellers. Buyer will be responsible for all real estate taxes due and payable in 2019. Farm is free for possession for the 2019 crop year. Farm is sold subject to confirmation of the Pers. Representative and without warranty or guaranty. Cropland acres are according to Yellow Medicine Co. FSA Office. This property is sold subject to existing easements, restrictions, reservations. Owners do not guaranty that existing fences lie on the true boundary and new fencing, if any, will be the responsibility of the purchaser pursuant to MN statutes. Information contained herein and all statements made are deemed to be correct but are not guaranteed. Statements made day of sale take precedence over all written material. The auctioneers represent the sellers in this transaction. Paul Bliss, Heir / Larry Vogt, Pers. Rep.